Recently, all the local buzz in the birding community was a Eurasian Wigeon seen at Fernald Nature Preserve. Since this would have been a life bird, I decided to "chase" it. Since I got off work early one day, I decided to make the one hour plus drive to try to get a look at the bird. I made good time, getting to the spot at about 1pm. Other birders had informed me upon my arrival that the bird had not been seen that entire day up to the point that I have arrived. I scoped the ducks that were present only to find an odd drake wigeon that I could not ID. I thought that it could of been the Eurasian, however others had no comment at the time on the bird. One birder insisted that the odd bird was THE bird. I had mentally debated that the bird must be a hybrid. As the bird was far off, no conclusion was ever reached. As I stayed at the location hoping for the Eurasian to show, more birders began to arrive and set up their scopes. As I was observing the people, I just felt out of place. It then became evident to me that I am not a chaser of birds. I am the type of birder that likes to go out and have that full experience rather then concentrate on one bird. Sure, I will go see a good bird that is close, but I prefer to just go out and watch birds. If I get lucky, good. If not, so be it. Many birders are into keeping numbers and lists. As I look back, I can't even recall what my official life list stands at. There are some good birds being seen just to the north of me, however I am in the minority as one that has declined to get the urge to chase them. I don't have lots of fancy photography equipment or a fancy scope. Maybe I am not a "serious" birder. Birding is about having fun, and I prefer a different style. You most likely won't see magazine quality pictures of rare birds from me. That being said, I am looking forward to see what spring migration has in store. Last fall had been very good to me, having seen two lifers within ten minutes from the house! 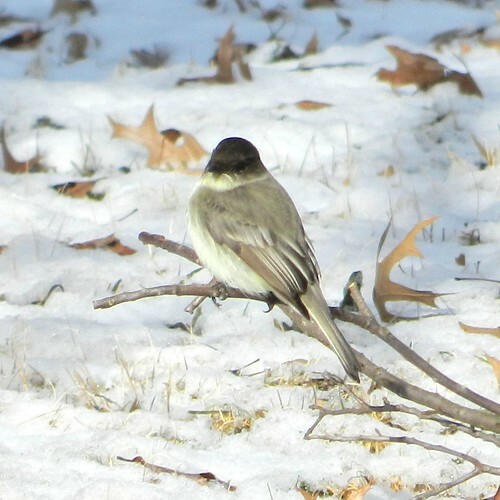 I have already had found my first Eastern Phoebes of the year. I don't know if they are birds that had over wintered or new arrivals. I suspect that they had overwintered, given the mild winter to date. I don't know if Phoebes are like groundhogs or not, as one of them had seen its shadow and got spooked. I wonder if this means six more weeks of winter? So, go out and see some birds, and make sure you have some FUN! Donald, I'm not a birder, just a bird photographer but for me going out is about the fun as well as the photos. I never know for sure what I will find but I know I'll see something wonderful. Nature never disappoints. Excellent observations-- more power to you. I'm seeing this sentiment crop up more and more in the Ontario bird blogging community, too. Donald I couldn't agree with you more. It's amazing how birders spend thousands of dollars flying here and there just to get one more life bird. Instead, I've decided that someday I'll just travel overseas & see foreign birds in their natural habitat. This sounds much better than chasing birds across the country. 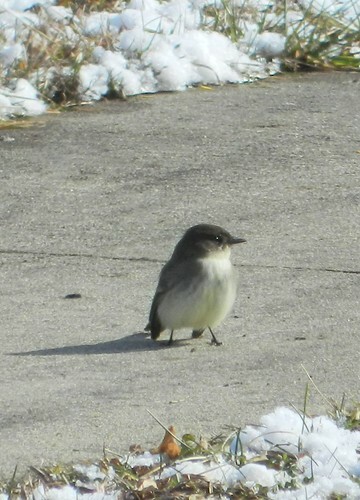 Here in Maine, the phoebes arrive in early May. They have nested in my garage for the last 14 years. Birding is enjoyed in many ways. I think that's what makes it so popular. To some it's a sport. Some like collecting species for their life list. I'm sort of like you. 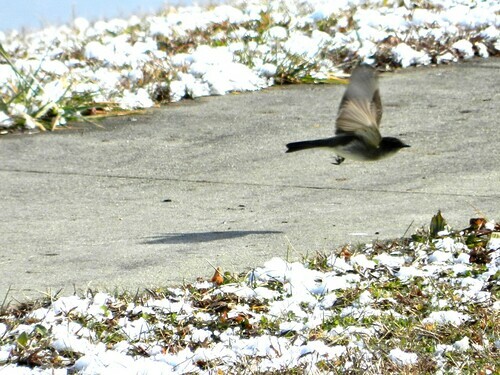 I just go out and bird. I prefer watching a bird for awhile and take notes rather rushing off to the next one. Donald, you made my day! I do not like the crowds of birders either and prefer the serenity of Birding alone or in small groups. I have chased a few birds, but mostly I am a lazy birder, getting up when I am ready and just going out to see what I can see. However, I do keep a Lie List made much easier by my obsession with eBirding. But whether listing or chasing or just sitting serenely on my back porch, I am ALWAYS having fun when I am watching birds! Nice post! Hi Donald, great post and I love the phoebe. I am much like you when it comes to birding and photos. I am not one to go off chasing a rare bird and there have been quite a few lately here in Maryland. I do keep a list but I have not updated the list with my last lifers. I do have fun birding either with my hubby or with my friends from the birding club. Have a great weekend and Happy Birding! I love that first phoebe photo, with the snow and leaves, etc--shows a good eye behind the camera. Nice shot! I want to say a word in favor of a little chasing--I don't do more than go to places I can drive to in an hour (two at most), but I have fun doing it. It gets me to new places, and I've found some great spots for birding that way. Plus I usually run into some very nice folks, and the shared excitement, the cameraderie and swapping of bird stories while waiting, and yes the thrill of success, make it all great fun usually. I know what my life list is, and wish it were longer, and enjoy writing down a lifer in it--why not? It doesn't mean I don't enjoy watching the birds I've already seen, too; no need to be just one or the other, seems to me. Anyway, people like birds in different ways, and that's the way it should be--I envy the skills of the serious listers, and they do a lot of good in keeping good records of what's out there, but so do feeder watchers, so eBird says. Room for us all. I will chase the occasional bird but try to get out birding at least once a week whether a rare bird is around or not. It certainly is fun to watch birds no mater what you see! Great post Donald and wonderful photos. I started out listing but found the fun was in watching the regular "unexciting" birds. I like all birds and found unless something is close by, chasing just adds stress. I don't think you have to chase or list to be a serious birder, you just have to like birds, and I am sure your observations of the non-rare birds shows that. Wonderful post, Donald! I'm not much of a chaser myself but I really do feel excited when I spot a bird I've never seen before. That said, I'm thrilled to see common birds in our area year round (Black-capped Chickadees, Blue Jays, Northern Cardinals, White-breasted Nuthatches, etc.). I never tire at observing their behaviors. The joy I feel when viewing beautiful birds just can't be beat! Donald, thought provoking post. I am sometimes a chaser, but it has to be fairly convenient and easy to arrange for me to chase. I get the most birding fulfillment in my patch and my own backyard and using eBird. I suppose even more than my interest in bird behavior is that my greatest enjoyment of birding is just seeing the variety and the beauty of each species.